I get free samples from General Foods Cereals on a regular basis. Sometimes I use them in recipes. Growing up, we weren't much of a breakfast family, particularly after I got old enough for school. My dad got up at the crack of dawn, had coffee, and headed to work before anyone else was up. I got up, didn't have coffee, and headed off to school. Mom was still asleep, but it's a fair bet that she didn't make pancakes for herself. Because of the general lack of breakfast foods in those formative years, I never developed a fondness for some of the most typical breakfast foods. My cereal preferences are pretty much limited to Cheerios and Chex. And while I don't mind French toast for lunch, the chance of me making it for breakfast is ... slim to none. On the other hand, I like cereal as a snack. Not with milk, but just as a crunchy treat. When that cereal turns into Chex Mix, I'm a happy camper. I've created my own versions a few times, and I've used other people's recipes as well. This time, though, I've got something different. I got a Chex Mix kit directly from General Mills, and they included their recipe. While I haven't made this yet, I've got all the ingredients squirreled away. I'll probably make this right after the New Year, when I've *ahem* disposed of all the candies and cookies that are currently hanging around here. I received these products at no cost; I was not required to post. Okay, you want the truth? I'm posting this here because it's a good bet I'll lose the recipe card. It's safe here. One of the benefit of being a blogger in the Denver/Boulder area is that Sprouts Farmer's Markets hosts events with local businesses, mostly food-related. Recently, I attended an event at Good Day Chocolate. I said yes, because ... well, chocolate. Even though I wasn't familiar with the company or its products. Turns out, the chocolate has benefits. Not just the flavor of chocolate or the benefits of chocolate in general, but they add stuff to the chocolate to make it even better. So ... there's chocolate with added caffeine for an energy boost, chocolate that helps you sleep, chocolate that has calming effects, and chocolate with turmeric. A new addition to the Good Day roundup is a chocolate with probiotics. And, they pointed out that their probiotics are the ones that actually make it through your stomach acids, so they actually do some good in your gut. Plus, eating a chocolate or three is a lot more pleasant than chugging a weird-tasting grainy drink. 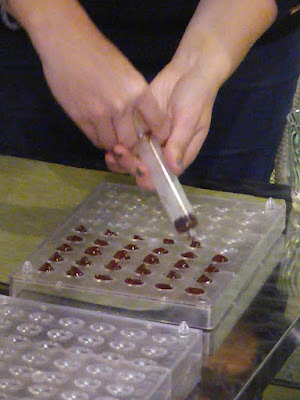 At the event, we had a chance to play with chocolates, like filling molds. They warned us that this could be messy, but there were no major chocolate disasters. When the company first started, they filled molds like this by hand, and had a lot of rejected chocolates in each batch. But now, it's a lot more sophisticated. And of course we got to do some sampling. Speaking of samples, we got to take some home, too. Like this cute holiday gift box. Mmmm. Chocolate gift! The chocolate comes in little tiny boxes, and they're roundish candy-coated treats that should be eaten sparingly. I mean, there's dosage information on the side of the box. Dosages are probably most important for the caffeine - or at least that's the one I'd be most careful of, since I've cut way back on my coffee intake. While these have health benefits, they're also very tasty chocolate. But ... they shouldn't go into the candy bowl to be eaten by the handful. This is one of the most interesting concepts I've seen in a long time. I've tried turmeric smoothies and other ways of ingesting it. While I love a good recipe that uses turmeric (mmm, pickled cauliflower), I'm not all that fond of it in my banana smoothie. In chocolate, however? I couldn't even tell it was in there. Sign me up! Good Day Chocolate is available at Sprouts (obviously), and I've also seen it at other stores that have a lot of natural/healthy foods. You can also find it on Amazon . Keep in mind that the boxes are small and don't have a lot of chocolates in there, so if you want a week's worth of energy doses, buy enough boxes! Thanks to Sprouts Farmers Market and Good Day Chocolate for the fun event and the goodies to take home. Mmmmm. Chocolate. 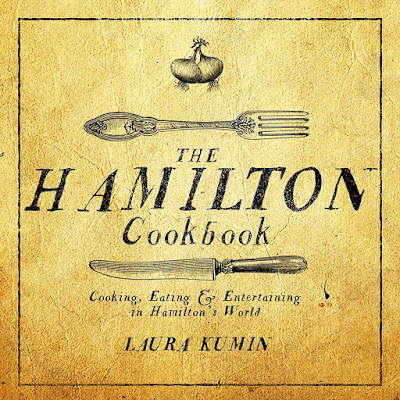 I'm participating in the Abrams Dinner Party, where I get cookbooks (and a little swag) from the publisher. 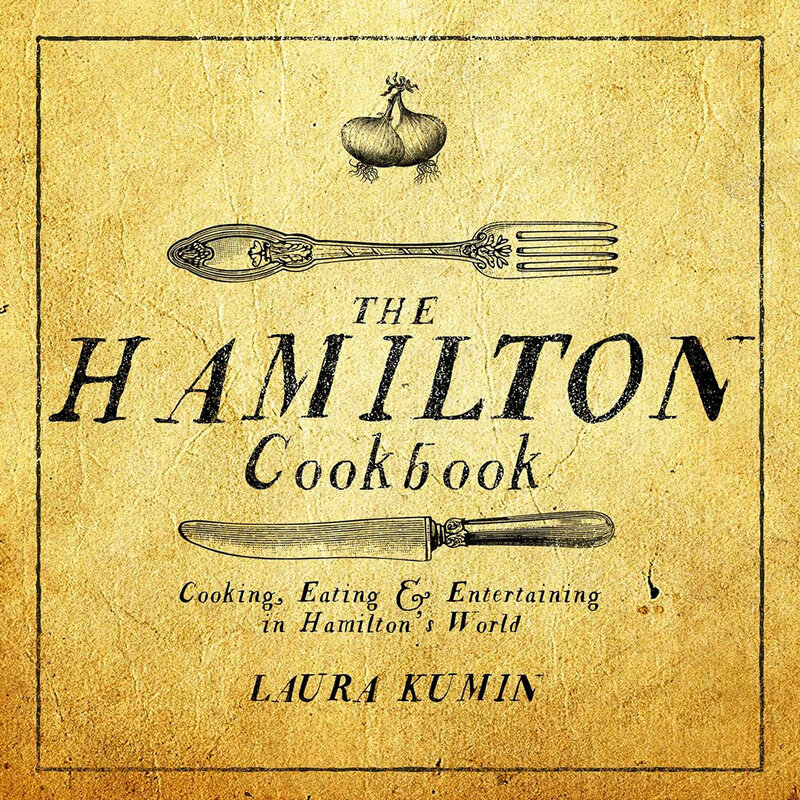 Since I'm a bit of a cookbook hoarder, this is great for me. 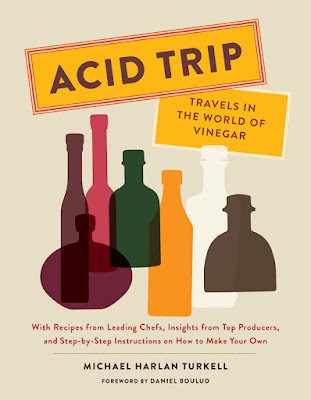 Once of the books I got was Acid Trip, which is all about vinegar. 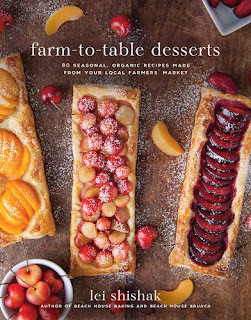 I adore tart foods, so a book about vinegar is right up my alley. I mean, I've even made my own vinegar from wine. There's a jar of it in the pantry right now. Out of that list, I've made a few similar dishes, and wanted to revisit them. In particular, the egg with vinegar was calling to me. I'd made a similar dish, but used red wine vinegar. The flavor was lovely, but the look was ... not great. The recipe in this book calls for white wine vinegar, which makes a whole lot more sense in terms of presentation. So I just had to do it. Breakfast for dinner just happens to be one of my favorite things ever. If this sound a little weird, it's really not. The acid helps to cut the richness of the egg yolk, and adds another dimension of flavor. I love eating tomatoes with eggs, but never thought about why - it's that hit of acid. In this case, you can add that acid without needing to have fresh tomatoes on hand. I think the vinegar pie is next on my list. How about you? Place the egg on a warm plate and season with salt and pepper. While the pan is still hot, add the white wine vinegar and allow to reduce by half. Serve immediately. I suggest some toast on the side. Yum. This post is sponsored by ABRAMS Books, as part of the ABRAMS Dinner Party. Look for more posts with the hashtags #AcidTrip and #VinegarCookbook. I adore Italian Prune Plums. I guess some people use them for making prunes, but I decided to make some jam. Because you can never go wrong with plum jam. My first encounter with Italian Prune Plums was when I lived in Chicago and my neighbor has a tree. Some years, there was no fruit at all. Some years, there were a few plums here and there. And some years, that tree was so full of fruit that the branches would bend until they were nearly touching the ground. Those years, my neighbors would hand me a paper shopping bag, half full of fruit. And I'd be eating plums every day. I'd never had plums like that before. They were tasty and tart when they were just barely getting soft, and they got sweeter as they got softer. They were greenish yellow inside with a very dark purple outside. The interior would go from green to a less green color that looked like it wanted to be a barely peachy yellow. When they're cooked, the inside turns bright red. Back in Chicago, it never dawned on me to make jam, but now I like the idea of having a few jars of homemade jam on hand for slathering on English muffins. This particular jam is also good for swirling into yogurt or on top of ice cream. I adapted this from a recipe on the Northwest Cherry Growers site. It was described as a plum butter, which is typically thicker than a jam - but it depends on how long you cook it to reduce it. That's what's great about a recipe like this - you can cook it less for something that's a little looser, or cook it more to get a super-thick fruit butter. I let mine cook until it was more jam-like than butter-like. I also made it a little less sweet than the original,and fiddled with the spices a bit. If you're going to can the jam for room temperature storage, I suggest using the original recipe - you really don't want to mess with sugar ratios when canning. But my version is great for refrigerator storage or for freezing. Run the plums through your food processor or blender until the mixture is as smooth as you can get it. In a large sauce pan, combine plums, cinnamon, salt, lemon juice, and sugar. Bring to a boil over medium-high heat, stirring frequently. Reduce heat and simmer, stirring often, until the mixture thickens and holds its shape on a spoon (or it reaches the consistency you like.) The time this takes depends on several factors, including how hard you're simmering, the shape of the pot, and how much moisture there was in your plums. If you cook at a spunkier boil, you'll need to watch more carefully and stir often to make sure the jam doesn't stick and burn. If you opt for a very slow simmer, it will take a lot more time but require much less attention. Taste and adjust sugar, lemon, and cinnamon to suit your taste, and cook for another minute or two. If the jam seems chunky or bits of skin are visible and you'd prefer them to disappear completely, you can give this another run through your blender or food processor. Make sure to exercise proper caution for blending hot foods in your particular machine. Transfer the jam to containers for refrigerator storage or freezing. For the original recipe, including canning instructions, check out Northwest Cherry Growers' site. The Cookies for Kids' Cancer campaign sponsored by OXO is one of my favorite feel-good things every year. Bloggers who participate get a few free products from OXO, but the money goes to charity. How awesome is that? Maybe you've heard of Wacky Cake. 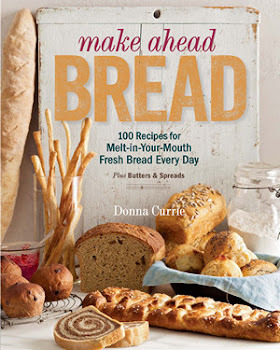 I have a vague memory of bringing home a copy of the recipe and making it at home, which must have been a huge event since my mom never baked anything. The major selling point that must have convinced my mom to let me make the cake was that it didn't require eggs, a mixing bowl, or a blender. The recipe was mixed by hand and baked in the same pan. The problem with that recipe was that it was hard to mix the ingredients evenly in a cake pan, without scraping off the butter or shortening that was greasing the pan. I've seen a lot of wacky cake recipes since then, but I hadn't given it much thought until I ran into yet another recipe in a community cookbook. And then I thought ... hmmm ... I wonder if this would work as cupcakes. While I was thinking, I also decided to cut the recipe in half, and I made a few other little adjustments as well. Because, what the heck. Might as well have some fun, right? Wacky cake is normally left unfrosted - maybe just dusted with powdered sugar. But I decided the cupcakes needed frosting, so I made a simple chocolate ganache and used the cool decorating tool that OXO provided to swirl the ganache on top of the cupcakes. So pretty! So easy! Not messy! They also sent me a really nice 12-cup muffin pan - looks pretty with a gold-colored finish, right? And they sent silicone baking cups as well. The muffin cups are pure genius, since they have little "ears" on two sides that makes it really easy to get the cupcakes out of the pan. See the "ears" on the muffin cups? Really handy! Preheat the oven to 375 degrees and place cupcake liners in 12 wells of a muffin pan. Combine all of the ingredients in a mixing bowl and beat with a hand mixer at high speed until well blended, about two or three minutes. Divide the batter evenly between the cups - they should be about 3/4 full. Bake at 375 degrees for about 18-20 minutes, or until the top of the cupcakes spring back when touched and a toothpick inserted in the center comes out clean. Remove the pan from the oven and remove transfer the cupcakes to a cooling rack to cool completely before frosting. Here's where those little ears on the cupcake cups really came in handy! When the cupcakes are fully cooled, frost as desired. Or, if you want to stay true to the original wacky recipe, just dust them with a little powdered sugar. For my frosting, I used a basic ganache with 6 ounces of cream, heated to boiling, poured over 6 ounces of semisweet chocolate, broken into chunks. At this point, you have a ganache that you can pour onto a cake to make a smooth layer of chocolate. But that's not what I wanted. After the mixture was completely smooth and starting to cool off a bit, I started beating it with my hand mixer until it was thick and fluffy and the color had lightened a bit. I piped the frosting on the cupcakes. YUM. NOTE: after seeing someone else post a vegan chocolate dessert recipe, I realized that the cake part of this recipe is vegan. Not that it's trying to be, it just is. It was thought to have been first developed during WWII, when dairy and eggs were rationed. That's why it uses oil. And it works really, really well. The frosting I made included dairy, so that's not vegan, but that's easy to swap for something else, like a faux-buttercream made with either vegetable oil or a non-dairy butter substitute. Or ganache made using a non-dairy cream (although I've never tried that). Or whatever vegan frosting or icing you like. The Non-Stick Pro Muffin Pan features a unique micro-textured pattern that ensures even baking and adds structural rigidity. It's made with a ceramic-reinforced, two-layer, commercial-grade coating that provides ultimate non-stick release and is scratch-, stain-, corrosion- and abrasion-resistant. The BPA-free Baking Cups have handy tabs to help remove them from muffin tins without making a thumbprint, and the inside of each Cup is smooth and non-stick to release your treat easily. With a fill line, your cupcakes will be consistent every time. Our easy-to-use, easy-to-fill Tool is designed to give you complete control while decorating. The unique trigger provides a smooth stream of icing for clean lines, and the comfortable handles ensure a steady grip and protect icing from warm hands. I went to a couple of different stores, and fresh green beans were nowhere to be found. Bummer. But then I realized that I had frozen green beans. Would it work? The lid made a lot of sense and I loved that I didn't have to do anything except screw the lid on. Nothing else to think about, unlike other fermenting methods I've used. I really liked the glass weights, since they had a grooved top that made them really easy to insert into the jars and take them out. After two weeks, I was really curious about the beans. there was a slight whiff of dill even before I opened the jar that was enticing. It reminded me of pickles that I like. Mmmm. The brine had good flavor, but the beans were a big nope. They were too soft to be pleasant to eat (although the flavor was good when I nibbled a tiny bit). Not a problem with the recipe, though. I really shouldn't have started with those frozen beans. I'm going to be looking for beans in the stores and farmers market, and I'll give this a try again. If you're curious about the recipe, here it is. Use fresh beans, okay? In a saucepan, heat water. Add salt and stir till dissolved. Cool to room temperature. Place garlic cloves, dill and chili flakes in the bottom of a pre-sterilized, quart-sized wide mouth mason glass jar. Next, add the green beans. Cover the jar with the Easy Fermenter Lid. Store in a cool, dark place (room temperature 60-70°F is preferred,) for 1 to 2 weeks. Once jar has been opened, move to cold storage. The flavor will continue to develop with time. I got the easy fermenter kit from the company at no cost to me to do a review. I decided to post the recipe, as well, since it's a keeper. So ... I like rice. A lot. I like plain old white rice and Mexican-flavored rice and rice pudding and risotto and paella and fried rice. Yeah, I like rice a lot. But ... most of my favorite rice dishes involved white rice. I know that brown rice is better for me, but I've never been that fond of it. I'll eat it, but I don't get all googly-eyed about it like I do over my favorite white rice recipes. That all changed a while back when I figured out how to make brown rice that's actually ... well, I won't say it's exciting, because after all it's still just rice - but it's something that I look forward to eating. It's so freakishly simple, too. It's not about how you cook the rice, because you cook it any way you normally cook rice, whether that's on the stove or in a rice cooker. Personally, I prefer my rice cooker because it's so easy. Okay fine, you can go ahead and tell me your tried-and-true rice cooking method that's always 100 percent foolproof. I had a foolproof method, too, until I moved to high altitude and rice became my nemesis. I decided it was a battle I wasn't willing to wage, so I bought a rice cooker. Problem solved. So anyway, when I cook white rice, I often flavor it with Better than Bouillon's chicken base . But I wasn't that fond of it with brown rice for some reason. It just wasn't a good pairing. Then I found the magic ingredient, again from Better than Bouillon. But this time, it's their mushroom stock. Oh heck yeah. The mushrooms enhance the earthiness of the rice while at the same time adding some richness and savoriness. It's the perfect pairing. The rice doesn't taste particularly mushroom-y, but it definitely adds something extra. If you want mushroom-flavored rice, add more of the mushroom base - but don't get too carried away, since the Better than Bouillon also adds salt. In fact, when I use it, I often (usually) omit salt. Sometimes I add butter or oil when I make brown rice like this. Sometimes I add a touch of saffron. Sometimes I add fresh mushrooms (crazy, right?) or I'll add frozen peas when the cooking time is done. I just stir them in and let the rice rest for a short while. They warm up, but stay bright green and they don't overcook. To be honest, I probably won't be making brown rice without the mushroom base ... unless I run out of it. And that will probably be a white rice day. Cook the rice as you normally do, with the added Better than Bouillon. Oh, and if you think the rice in the photo is a teeny bit overcooked ... perhaps it is. I've been messing around with a new appliance as well as some new brands of rice, so it's not a perfect as it could be. This is NOT sponsored, encouraged, or nudged by any companies. and I didn't get any samples. Okay, let me admit this. You know those cooking competition shows on television, where a bunch of cooks are set loose to cook stuff in an unfamiliar kitchen? You know, like The Next Food Network Star? Or maybe Master Chef? Those are my guilty pleasure. Except I'm not so guilty about it. I don't watch sports on television, so I think you can cut me some slack for watching people scramble to poach the perfect egg rather than watching them plopping a small ball into a hole in the ground. 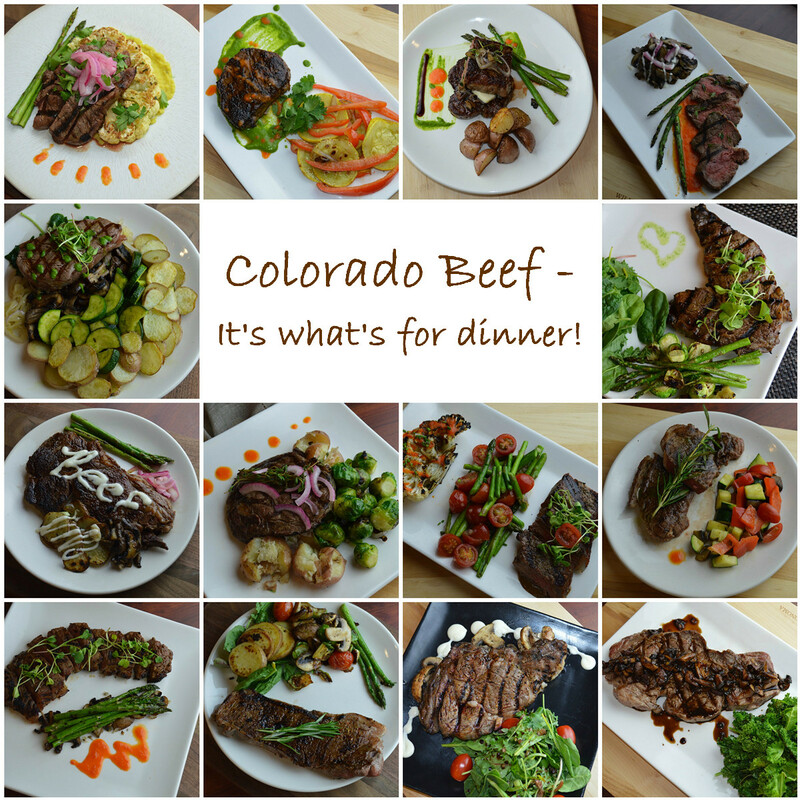 So anyway, Sprouts Farmer's Market hosted a blogger event at the home of the Colorado Beef Council. I attended an event there in December that focused how to cook beef roasts. This being grilling season, we learned about steaks and grilling. The had some great handouts about beef in general and a super-handy chart that listed different beef cuts and how to cook them. And about nutrition, storing, reheating, and more. And there was a pamphlet with some recipes, too. We also learned that Sprout sells two types of beef. The first is grass fed beef that is 100 percent grass fed - never corn - and is raised with no antibiotics, ever. The second is natural beef, which is grass fed and grain finished. The cows do not receive antibiotics for the last 300 days, but it's possible they might have received them before that. Someone asked if Sprouts carried organic beef, but it was explained that they used to buy organic beef from a trusted supplier, but there came a point where they sold so much beef that the supplier couldn't keep up with the demand. There just isn't enough organic beef out there. 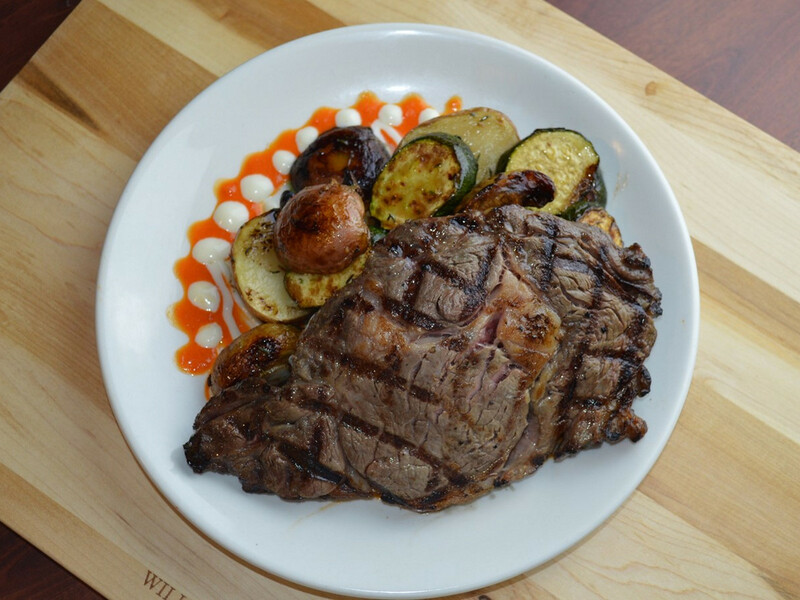 We were told that we could pick from three different types of steak - ribeye, tenderloin, or strip. We could also choose where we wanted to cook - oven, grill, or stove (with different pans available). We could choose from a variety of different seasonings, and we could choose from a bunch of fresh vegetables and herbs, as well as some grains. There were also a few sauces including a red pepper coulis and a horseradish sauce. Although they didn't say, "Ready, set, GO!" that's sort of what it was like as the teaching portion of the day was complete and we were set loose in a commercial kitchen to create and plate our own vision of what that evening's steak dinner. And then bloggers scrambled in every direction. Some chose their steak first, while others claimed their work space. Still others went to the "pantry" where the vegetables and spices were waiting. Some chose their utensils, but that's the last thing I did, so I ended up cutting my vegetables with a fillet knife. It was super-sharp, so it didn't really matter that it wasn't a chef's knife. Unlike the shows on television, however, there was no pushing and shoving. Everyone was polite, and waited their turn at the ingredients. No one yelled "medic!" The staff was awesome, answering questions and pointing toward ingredients and tools we needed. And they got stuck cleaning up the mess we made. When it came to the vegetables, there was a limited amount of each: a small cauliflower cut in half, a bunch of asparagus, a small bag of baby potatoes, a few summer squash, a few types of mushrooms. No one went hungry, and no one hogged any of the ingredients, but it meant that everyone chose different combinations of sides. Which actually was kind of brilliant. I would have been happy with the steak slathered with all of the mushrooms, but I took just a few mushrooms. And a zucchini. And some potatoes. And then the prep and cooking began. Unlike competition cooking shows, we weren't given a time limit for our cooking, although it was suggested that we be finished by a certain time so we could all take photos of our plated food and then get down to the devouring. I decided to cook my vegetables on a sheet pan in the oven. I seasoned them with salt, pepper, and thyme, then drizzled with olive oil and balsamic vinegar and popped them in 450 degree oven that would look really good in my kitchen. 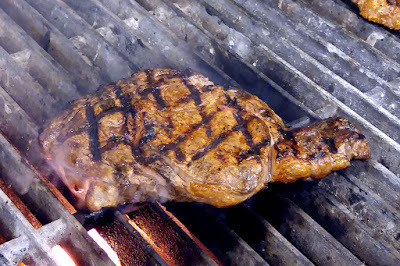 I think I was one of the few who used the oven, but I chose that method so I could pay more attention to my steak. 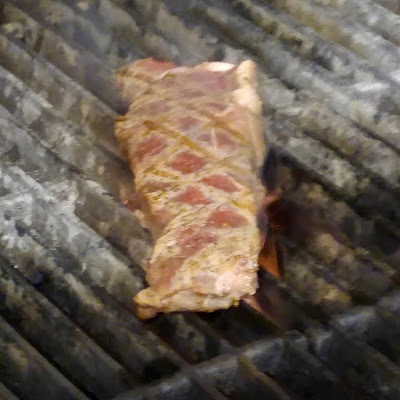 The area near the grill was really hot, but I wanted to give it a try. Ooooh, grill marks! Flames! Wheeeee! The folks who didn't use the grill worked on one of the stoves. 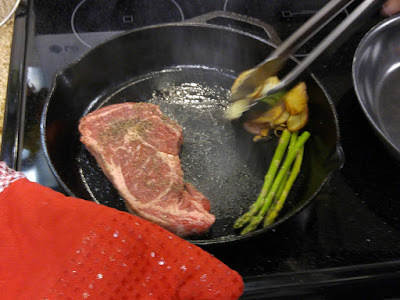 Here's a happy steak sharing space with the sides in a cast iron pan. 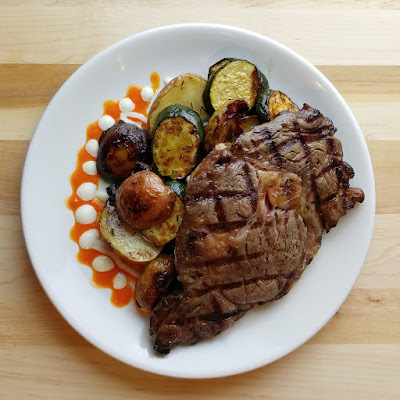 We were told that a 3/4 inch steak should take 6-7 minutes to cook, but I cooked mine slightly less because I knew that most of it would be coming home with me as leftovers. I wanted to be able to cook the leftover steak at home without overcooking it. An area was set aside in the lobby with a nice light for photos, and the photographer who handles the Colorado Beef photos was on hand to document our successes. Because they were all successes. Of course they were, because we all cooked food that we liked! Each blogger also took photos of their own steaks, and when were were all assembled and eating, we were treated to a slideshow of the photos that the photographer took. It was pretty amazing to see how different all the plates were (check out the collage at the bottom of this post!) We all started with the same meat and we chose from the same array of vegetables, but they all looked very different from each other. And here's my photos - slightly different angle, but still top-down. I really should have put a garnish on there, but I was pretty hungry and everything looked and smelled so darned good. Beef. It's what we all had for dinner! After I plated mine, I realized that I should have cooked something to add another color. 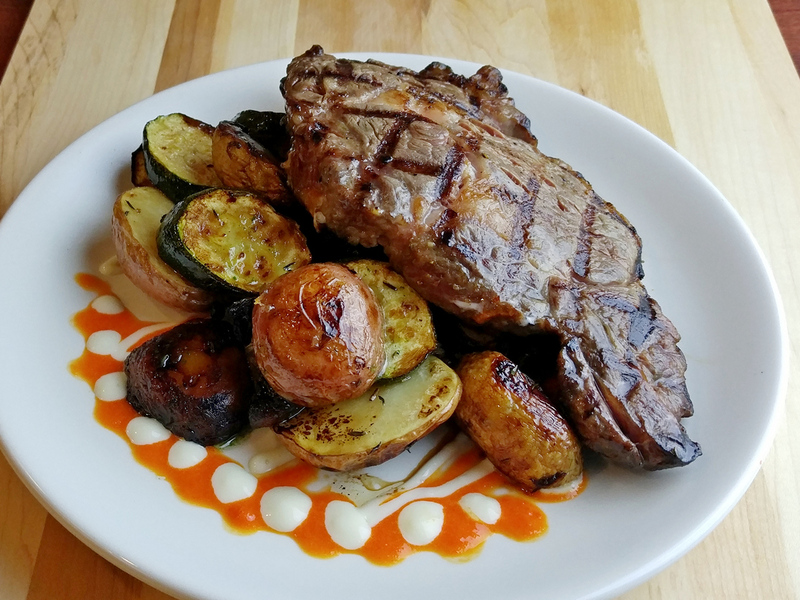 While my beef and vegetables were nicely browned and looked darned tasty, the presentation could have been improved if I had chopped some herbs or piled some of the pickled onions on top of the steak. Or maybe a quick salad from the fresh corn on the cob and some red bell pepper. But ... when I was choosing my pantry ingredients, I was thinking more about what I wanted to eat than what the plating should look like. I was thinking more like a hungry person than like a blogger! I also should have chosen a larger plate or perhaps a different shape ... but when I went to grab a plate, I didn't realize how many choices there were. So ... basic round white plate for me. Other people were much more creative. I did use the sauces to decorate my plate, however. And they were delicious. Unlike competition shows, no one judged us, we didn't have to hold our hands in the air when we were done cooking, and no one else tasted our food. We sat down, chowed down, and then we had dessert, too, all provided by Sprouts. Handy to-go boxes helped us take our leftovers home (YUM!) and pretty soon we were on our way with full bellies and a better understanding of beef. Thanks to Sprouts Farmers Market and Colorado Beef Council for sponsoring and hosting this event! When I was a kid, the best part of summer was walking with my mom to an empty lot a few blocks from where we lived. A guy would park a truck in the lot and sell fresh fruits and vegetables, weighing them on a hanging scale and putting them in paper sacks. When cherries were in season, my mom would buy some for me. I'd munch on them all the way home, spitting the seeds out as I went. By the time I got home, there were no more cherries. I'm surprised a forest of cherry trees didn't sprout along our route. When the nice folks at Northwest Cherry Growers asked if I wanted to be a #canbassador, I jumped at the chance. Enough cherries to do some canning? Count me it! 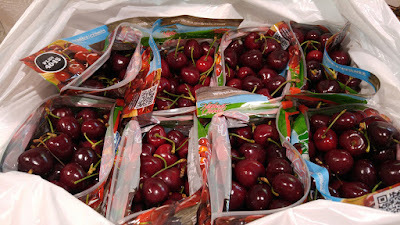 I'll admit that I might have eaten several pounds of cherries all on my own. But I didn't spit the seeds all over the living room. That would have been weird. The rest of the cherries were pitted and divided up for several different recipes. My two favorites were a smooth cherry jam, and some brandied cherries. I also made a Luxardo cherry recipe that was good, but not perfect. I think it would have been better with tart cherries, or perhaps I need to tweak the sweet/tart ratio. If you like Luxardo cherries, though, that recipe is a great starting place. Check it out! The recipes I'm posting here were based loosely on some that I found on the Northwest Cherries site, but I cut back on the quantities so I could try more recipes. Since I made so little of each recipe, I didn't actually can them for preserving, though. I tossed them into the refrigerator and started using them right away. The great thing about making recipes for use "now" rather than canning is that you can adjust the sugar and acid to your taste, rather than for preservation. If you're making vast quantities of foods for long-term, non-refrigerated storage, make sure you're using a recipe from a trusted food preservation source. There's no sense spending the time and money to make a dozens of jars of jam, only to find they've molded in the jars when you open them. Yeah, my mom made moldy jam once. It wasn't pretty. Based on a recipe from Northwest Cherry Growers. Oooooh, this was so good. I used these as a topping for ice cream. Adults only, of course. They'd also be nice in cocktails, but for that I'd suggest not chopping the cherries. If you don't happen to have brandy, it should work just as well with bourbon or whisky. Maybe even rum. Combine the cherries, sugar, and lemon juice and bring to a simmer and let it cook for a minute or two. Add the brandy, bring to a boil, then turn off the heat. Transfer the cherries and liquid to jars or other storage containers (this makes about a pint, plus a little extra) and allow it to cool, then refrigerate. Next, I made a cherry jam, also based on a recipe from the Northwest Cherry Growers website, but I used sweet red cherries instead of yellow ones. Put all the ingredients in a blender, and blend until smooth. If you're not sure about the sugar amount, feel free to start with less - let's say about 1/2 cup - and add more sugar later, if you want more sweetness. Transfer the blended cherries to a saucepan and heat to a boil, then lower to a happy simmer. Continue cooking, stirring often, until the jam reaches your preferred thickness. Like the napkin? Get them here. Since it will become thicker as it cools, the best way to check it is to put a small amount of the jam on a spoon and put the spoon in the refrigerator to chill. Taste your thickness tester and add more sugar to the pot, if desired. If you prefer more tartness, add more lemon juice. Continue cooking until your optimal thickness is reached. Since I wanted to stir into yogurt or drizzle onto ice cream and for spreading on toast and muffins, I left it a little looser than if I only wanted it as a spread for toast. Transfer to jars (this will make a bit more than a pint) or other storage container. Let it cool, then refrigerate. *Make sure your cherry pitter is actually ejecting every single pit from the cherries. Sometimes one will get stuck, and since you're blending, it could be a problem. When I was done with this recipe, I had just a little jam left in the pan. Not enough to fill a jar, but more than I wanted to throw away. I added some pitted chopped cherries and let them cook a while to create a chunkier, not-as-sweet jam, adjusting sweet and tart on a whim. Did I write anything down? No, of course not. But that's the great thing about refrigerator jams - you can wing it, adjust flavors on the fly, and end up with a little half-pint of something fun. Thanks to Northwest Cherry Growers for sponsoring! Napkins shown in photos provided by The Napkins at no cost to me for use on my blog. 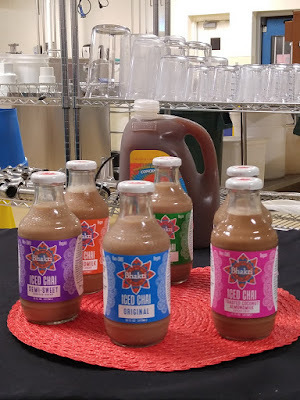 Bhakti Chai is a local company, and I was recently treated to a tour of the facility thanks to Sprouts (a grocery store chain, if you're not familiar). As soon as I sampled the product at the factory, I thought it would make a great marinade for chicken. Maybe I was just hungry. Yeah, I know. it's a drink. It's not a marinade. But the ginger-forward flavor just wanted to be used in cooking. So ... we got to take some samples home, and after having a little pick-me-up, I decided to give Chai-Chai-Chai Chicken a try. But, being me, I didn't actually do a marinade. Nope. I bought some boneless, skinless chicken breasts and I cooked them sous vide. I know I post a LOT of sous vide recipes ... but that's because they're so easy and hands-off. Most of the time, I finish the recipe with a quick sear on the stove or maybe a broil in the oven, but that's all I have to do. With the chicken breasts, I just sliced and served. Let me say here that sealing a sous vide bag that has a lot of liquid in it can be a little tricky. I didn't add a LOT of liquid, but if you're skeevy about having any liquid at all to deal with, just freeze some of your marinade mixture - in this case the chai - and put that into the sous vide bag. If you've got a giant thick hockey puck of frozen stuff in your sous vide bag, you might want to extend the cooking time a little bit, but if you froze a 1/2 cup in a baggie so it's thin and flat, it's going to thaw pretty quickly. And seriously, you don't need a lot of marinade or sauce or whatever in the bag. You can cook each chicken breast in its own bag (which is great if you're adjusting flavors to people's personal preferences) or cook them all together in one bag. Just make sure the breasts are in one layer in the bag, if you're doing a bunch of them together, so cooking is even. Let's assume we're doing just one chicken breast, okay? If you've got those giant chicken breasts, one breast might be enough for two people, depending on what you're serving with it. If it's really huge, feel free to add another 15 minutes to the cooking time. So, put the chicken breast in the sous vide bag and add 1/4 to 1/2 cup of the Bhakti Chai - depending on how comfy you are with dealing with wet ingredients in your sous vide bag. If you were smart enough to freeze some of the chai ahead of time, you're so much smarter than me. Add a pinch of salt, if you like. Vacuum carefully and seal. Use the wet sealing feature, if yours has that option. If you want to be extra sure you have a good seal, wipe the recently-sealed end of the bag to remove any moisture, and seal it again on the end. Set up the sous vide for 150 degrees. Chuck that chicken in there and set for 1 hour (or a little longer, if it's one of the huge breasts that they sell these days). Now go and do something fun. When the chicken is done, remove it from the bag. Slice and serve. That's it. No muss, no fuss. I didn't even bother browning the breast afterwards, but you can do that if you like. This was also great cold ... try it on a salad with an Asian-style dressing and some bean sprouts and snow peas - or maybe some of crispy fried wonton skins. Yum! Bhakit Chai is a great example of a small business started by one passionate person. The original Chai product still exists, but the company has expanded the product line to include more flavors, a ready-to-drink line, and some fizzy chai drinks as well. The fizzy drinks might have been my favorite, since I'm a fan of ginger ale and similar fizzy drinks that are less sweet and more refreshing. But that doesn't mean I didn't like the others. The ready-to-drink iced chai is perfect if you just want to grab one and go. That's them, in the photo on the right. Lots of options, including one coffee-chai drink. 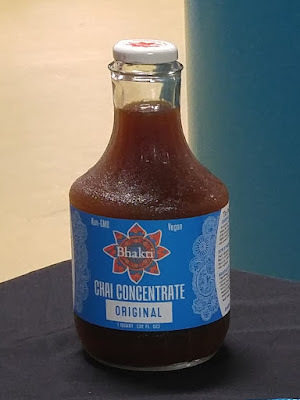 The concentrate is what you need in the fridge for drinking at home. I've been making mine with about 1/3 chai concentrate and 2/3 with either milk or almond milk, but of course you can adjust that to your preference. And you can drink it hot or cold. If you're me, you can also use the concentrate in recipes. I was thinking that rice with a little chai would be really really nice with a stir-fry dinner. And chai rice pudding is awesome. Simmered down to concentrate the flavor even more, it would be a nice sauce for either sweet or savory. While you can find some of the Bhakti Chai products on Amazon, you probably want to just go look for them at the grocery store, since they're a perishable product. Like, you know, go to Sprouts and buy them there. One of the best parts about going to tours of different companies is seeing how things are made. here's a super-short video of the bottling line at Bhakti Chai. It was cool watching it work. Yum, chai! Thanks to Sprouts for sponsoring and arranging the tour and to Bhakti Chai for being such a great host (and for the samples! ).